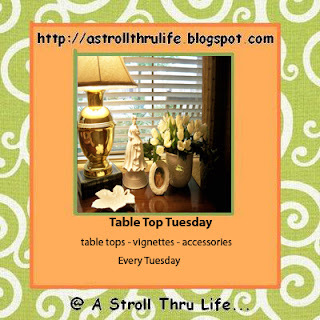 Welcome to the 73rd Table Top Tuesday. Every week you guys come up with more and more amazing eye candy that just makes me want to start all over again. I love it. So much inspiration. Now of course you knew that I would probably show you a cloche since I don't want you to forget the upcoming "Summer Cloche Party" that will replace Table Top Tuesday on the 19th. I hope you are all getting ready, these parties are always so much fun and you guys are totally the most creative bunch in the world. I kept most of the things I had on the breakfast table and just added a different rooster and topped it with a cloche. 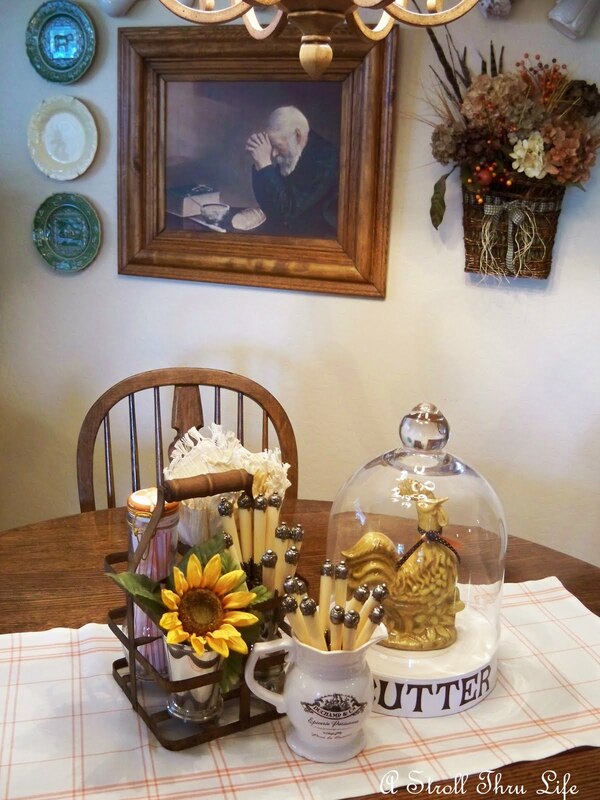 Anything under a cloche looks so important and totally makes a vignette. So remember to put the 19th on your calendar and get those cloches all dressed and displayed. Remember you don't have to use just a cloche. You can use an apothecary jar, birdcage, hurricane or anything that you can create a display in or under. We want to see all of them. Also, don't forget to go to CHUBBY AND CHIEQUE and enter for the giveaway to win these four beautiful little cloches and the teacup spoons. Just click on the link on my sidebar and leave a comment for one entry and become a follower for a second entry. There is also a surprise second gift. So run over there and enter. I just love your pretty vignette. Is that flat ware that has such pretty handles in your pics? Marty, your rooster under glass vignette is so cute. Looking forward to next week's party! Marty, you are a gal after my own heart. Those teapot spoons are to die for. I love them. They look like something I've seen out of Tea Time magazine. You always have the cutest things. I also love the picture hanging on the wall. Gorgeous. I am changing my blog. Unfortunately I've been having a terrible time with The Love Affair. It has practically driven me mad trying to work out the bugs. However, since I'm starting a new life over in MS I thought it was good to start a new blog as well. I would love for you to come visit me often. I get tickled when I see that you've left a comment for me. I hope to see you soon. Pretty vignette, Marty. Thanks so much for hosting TTT and the Cloche Party. Love your pretty table vignette. I would love to have a butter dish like that. I love it with the cloche! What a pretty tabletop. Love the butter dish!! Looking good Marty! I will have to come up with a cloche post for next week. I haven't ever joined in on a summer cloche party. Thanks for having us. I must get busy & work on some little corners for the party. Thank you for hosting TTT again this week. p.s. Although I linked my cupcake/tea party, be sure to come see my quilt one, too. I think you'll like it & my friend Linda could use your prayers. Great vignette, Marty. The roo is cute under glass. Thanks for hosting. Where did you find that butter platter??? It' magnificent. Marty, Loving your vignette using the cloche. I love the butter dish. Looking forward to your new party. Thanks for hosting. Love your rooster! Can't wait for your party! Thanks! Looking forward to the cloche party! Love your little rooster under yours. Loving the cloche Marty! It is darling! Your vignette is as pretty as always. Roo has a lovely new home under that cloche! love that little pitcher with the ivory handled silver for display. Looking forward to the cloche party next week. Bentley and I have been putting on our think caps!! Well, Marty, that is really cute!! I just love that! I had never heard of a cloche until I "met" you! Someday...I may have one! Great stuff in this linky party, Marty! 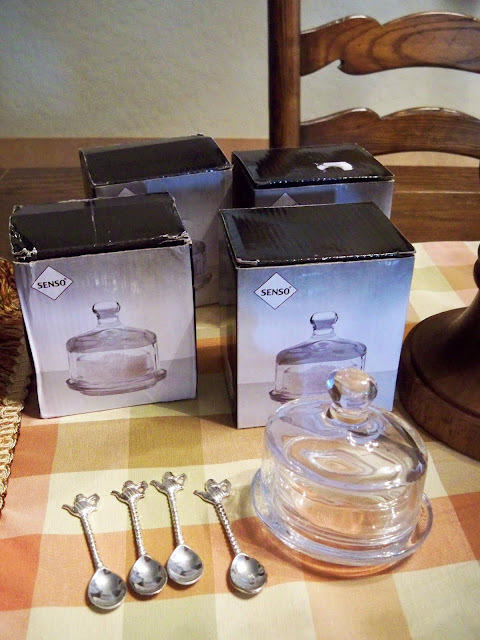 Those are sweet little cloches for some lucky winner. Your cloche parties are always such a success. Thanks for being the party lady, Marty! Oooh...your cloche looks sooo pretty, my friend! Your rooster is awesome and I just love the black and white "butter" base! What a pretty vignette for you breakfast table! It's so bright and sunney...cheery! 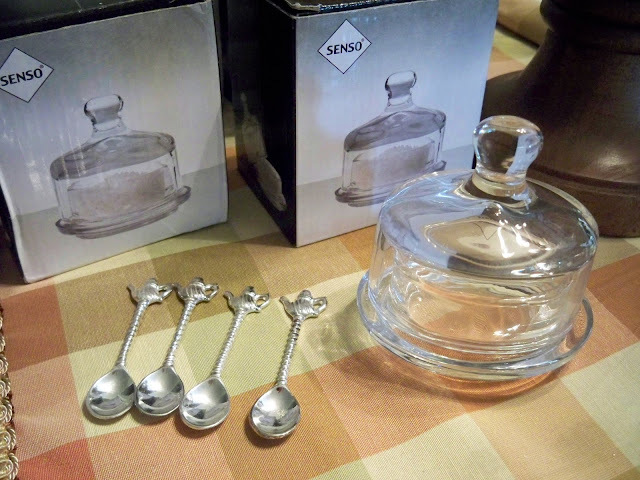 Thanks for sharing your beautiful cloche with us, dear friend and thank you for hosting this sweet TTT partty too! 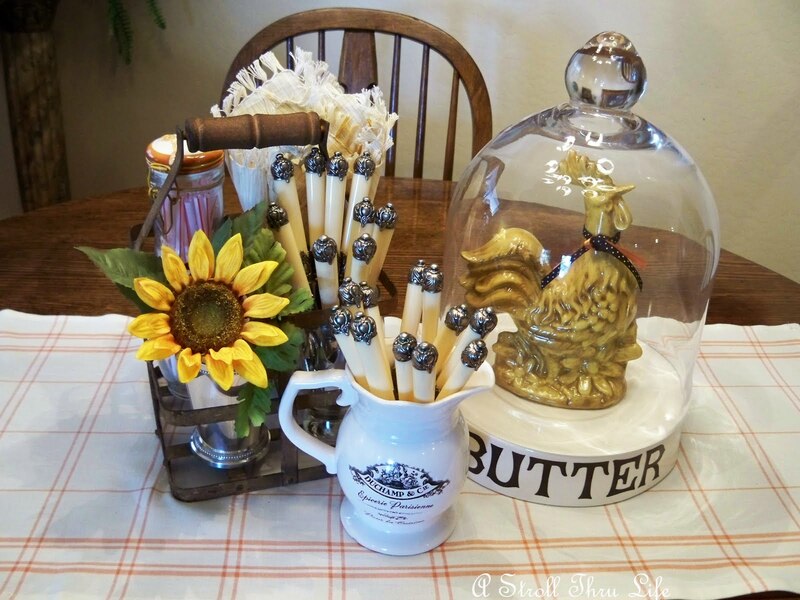 I love your "butter" base and I'm looking forward to putting something together for your cloche party! Have a great night! I just love your rooster topped with a cloche. Your table top designs are gorgeous and give me inspiration. Thank you for hosting. Marty, you are the queen of table tops--and a party animal! Thanks so much for giving us a vent for our creativity, and for inspiring us with your lovely creations. Hey Marty, Hope you are enjoying a fab summer! Beautiful tabletop post this week love all the earthy colors. I'm especially partial to that painting of the old man praying (it always hung over my Grandmother's kitchen table) Glad I stopped by and joined in your party,thanks for hosting! (hope your visitors will check us out, we are hidden in your margin - that must make us marginal ha!! Your table vignette looks wonderful. 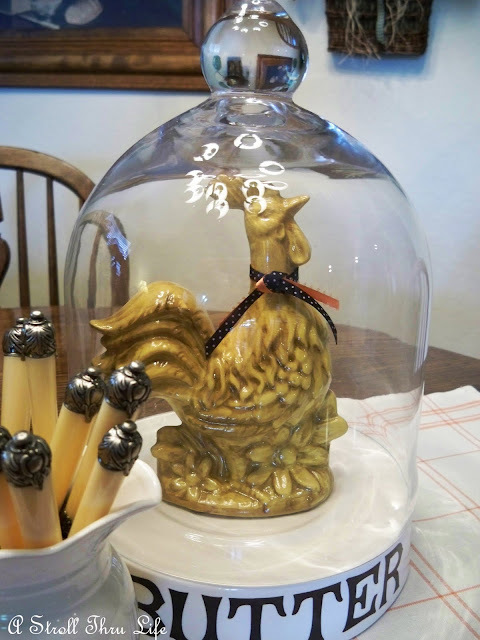 I love the rooster under the cloche! Thank you for hosting and have a wonderful day! Love your cloche idea...normally I have desserts under ours...but I just started a diet :( so this will get my creative juices going! I haven't changed mine since I put the shells in them. The problem is, I still like them that way...so, do I show pictures of the same cloches, or do I change them...even if I still like them? Decisions, decisions! Thanks for hosting. Better late than never! Marty I know it's not nice to "covet" but that butter dish is one of my dream pieces *winks* I hope I can scrounge up some cloches to join the new party! Wow i really love your blog..